Designed to remove odour-causing residue from your washing machine. Very easy to use just pour a little onto a cloth and wipe round the rubber seal and then rinse off with a damp cloth, that's the hard bit out of the way. Next pour 1/3 of the bottle where you'd normally put the powder. Then do a normal wash cycle with the hot water setting and that's all there was to it. machine had finished it had obviously worked as intended. Just as it claimed there would be no residue left behind - there wasn't. After opening the door and having a good sniff inside the drum I was pleased to note that it did indeed smell fresh and clean. I was a little hesitant to put my dirty washing in later that day as I didn't want to ruin the freshness, but I figured I could just redo the freshening process again in a months time as suggested on the label. machine's ability to wash clothes. It will improve the lifespan of your washing machine and clothes! It is safe to use in any washing machine as it is non-corrosive. 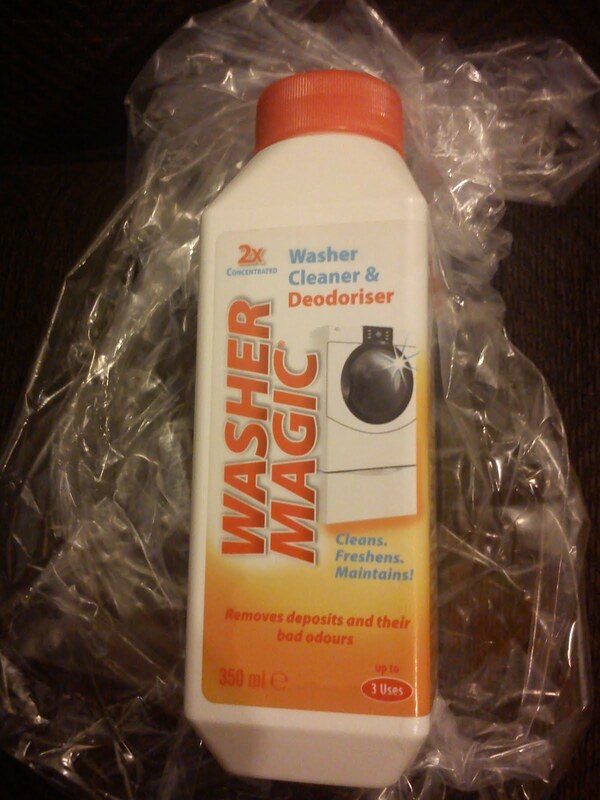 With enough detergent for 3 cleaning cycles at £3.99 from www.unitfit.co.uk, the Washer Magic is great value for money.